Johann Sebastian Bach was one of the greatest classical composers of all time (for example, read this and this). Many people have pointed out that his oeuvre is both enormously large and enormously varied and that it hardly has any weak spots. Many people even rave about Bach that his work is indeed flawless and use hyperboles like that Bach's music was divinely inspired, that Bach was God's pupil or even, perhaps only half-jokingly, that Bach IS God. John Eliot Gardiner, the famous conductor, has written a new book called Bach: Music in the Castle of Heaven. In this video, he says that biographers of Bach make a logical error by thinking that because Bach made such great music he must have also been a great man. Then, Gardiner goes on to say that Bach certainly wasn't a paragon of virtue and that he actually was a deeply flawed character. He says this because in Bach's life, according to Gardiner, there is "almost a repetitive pattern of antagonistic behavior between him and authority -- the authorities for whom he worked". I agree with Gardiner's first assertion: great music does not imply that its maker was a great person. I find Gardiner's second assertion, that Bach's character was deeply flawed because he constantly seemed to be in conflict with people of authority, unconvincing. Assertion 1: Great products don't imply great makers. I wholeheartedly agree. The greatness of Bach's work, however, does seem to say something positive about him. Being able to make such a huge body of outstanding music required an enormous and lifelong dedication. The level of skill which Bach developed is admirable. But this does not necessarily say that he was a great person in a broader sense. Bach's qualities such as dedication and discipline do not guarantee, for example, that he was also an honest or a kindhearted man. The tendency to generalize some positive impressions about a person to a whole range of other characteristics is known as the Halo-effect, a well-known cognitive bias. Assertion 2: Bach's character was deeply flawed. I am completely unconvinced. When someone describes another person as a deeply flawed character I imagine an oppressive, dishonest, mean-spirited, or anti-social person. But Gardiner calls Bach's character deeply flawed because he constantly seemed to challenge authority. I wonder, does challenging authority make you a bad person (or a 'deeply flawed character')? 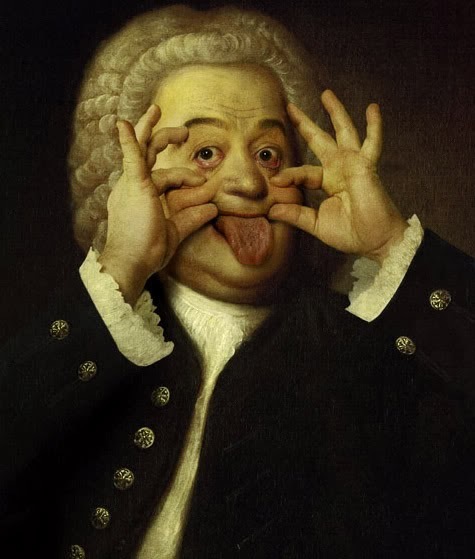 One could just as well argue, it seems to me, that Bach may have been ahead of his time not only musically, but also socially, by challenging authority. In my view, unchallenged authority is recipe for disaster. Because people, like Bach, challenged authority our societies have become more democratic, just, equal and civilized. I would argue that challenging authority is always a prerequisite for societal progress. Another mistake? Gardiner does not make the mistake of falling for the halo-effect bias but perhaps he falls prey to another mistake. In order to explain, I first have to introduce social comparison theory, which was initially proposed by Leon Festinger and later importantly advanced by others (such as Wills, 1981). The theory is about how people evaluate themselves by comparing themselves by others. They do this not only to get an accurate picture of how they are but, also to retain a positive image of oneself. The latter motive is called the self-enhancement motive. This self-enhancement motive is a strong motive which affects how we compare ourselves with other people and with who we compare ourselves. For example, we may use downward social comparisons to feel good about ourselves. Also, we may use upward social comparisons to inspire us. Strategies for protecting one's self-worth: When we are confronted with extraordinary achievements by other people, this may threaten our sense of self-worth. If the other person, apparently, is so great, how utterly un-great does that make us? Social comparison theory says that, when we are confronted with other people's greatness, we may, consciously or subconsciously, apply several strategies to protect our sense of self-worth: 1) trying to surpass the other person, either in a fair or unfair way, 2) downplaying achievements of the other person, 3) avoiding the presence of the other person, and 4) by depreciating the importance of the achievement of the other person. The desire to detect weaknesses in high-achievers: When we witness someone doing something great, we may, among other things, experience an unpleasant emotion. We do not like to feel that the other person is better than us. In order to restore our sense of balance we may focus on what is wrong about the other person. By doing that, we may discover that the person may be great in one domain (for example 'composing') but terrible in another domain (for example 'a deeply flawed character'). I hypothesize that we may always have the reflex to focus on their weaknesses when we are confronted with a high-achiever. We may even perceive weaknesses that aren't there. Perhaps Gardiner needs Bach to be a deeply flawed person. Considering the time in which J.S. Bach lived the composer himself would very likely attribute his talent to God and consider himself easily as a man with many imperfections indeed. As far as the assertion by John Eliot Gardiner goes that J.S. Bach showed regular antagonistic behaviour: to be able to produce "out of this world music" (as J.S. Bach's work is so often referred to) required perhaps a personality that stands out. Since we can't ask J.S. Bach, we will never know so why not respectfully take a step back and not judge too easily. To idealize and generalize is human, apparently. But consider this: J.S. Bach as a person in his time perhaps simply wanted to use his talents, make the best of his life and survive in tough times as was typical of that era. And in the meantime he produced an enormous amount of great music that still centuries later mysteriously leaves us in awe. It is perhaps the whole mysteriousness that surrounds J.S. Bach’s music that compels us to fantasize about his personality in search for an explanation for J.S. Bach's emotive gift. But, maybe this kind of inspiration can't be explained as other composers after J.S. Bach perhaps would argue: it should be enjoyed instead.